Limited Supply of this Limited Edition! 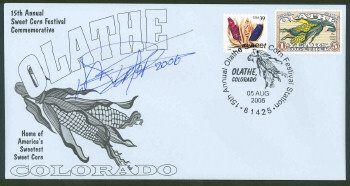 Cacheted monarch sized commemorative envelope of the 15th Annual Olathe (Colorado) Sweet Corn Festival. Cover includes special, 15th Anniversary stamp commemorating the 2006 Corn Festival plus USPS Crops of America Corn stamp. Coordinated cover and stamps are nicely tied together with USPS pictorial cancellation from the Olathe Sweet Corn Festival Station (for more information regarding the special postmark refer to the web site link below and also see Linn's Stamp News Aug. 7th edition, page 40). 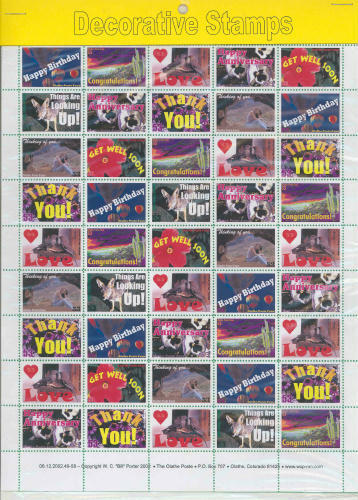 Commemorative Covers are also autographed by the artist/designer of commemorative stamp, cover, and postmark. BONUS! Each cover purchased here will also include a descriptive insert (envelope stiffener) describing this year's special landmark Corn Festival and the postmark authenticating the piece. Supplies are limited and only available on a First Come - First Served basis!